I have been hearing so much about IT Cosmetics your skin but better CC cream. This is one of those products which YouTube made me buy for sure but did it live up to the Hype? Well, I was lucky because I got a sample of the IT Cosmetics CC cream so that gave me a chance to try out this product before investing in the full size, not easy on the pocket as it costs $38 for a 32ml tube. I got the shade medium in a small sachet. I thought it may last me one application, nope, it lasted for at least 4! That was enough for me to go for this product because it had a lot of pros. For starters, the packaging is very sophisticated and you can tell you got a good quality product. The actual tube has an easy to use pump as well. 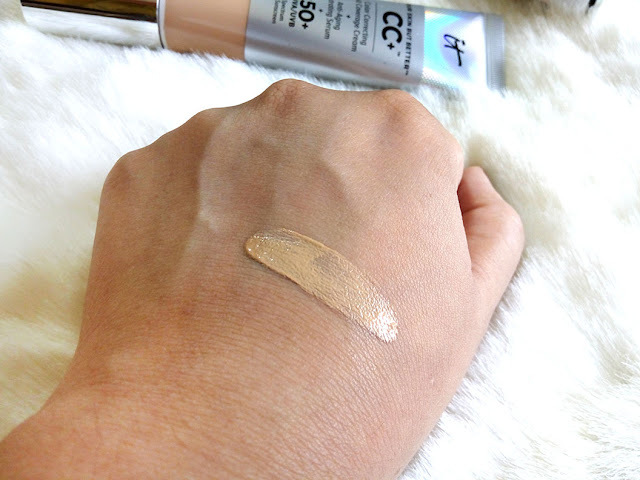 The CC cream comes in 7 shades, the shade medium suits me fine (I am NC30 - NC35). 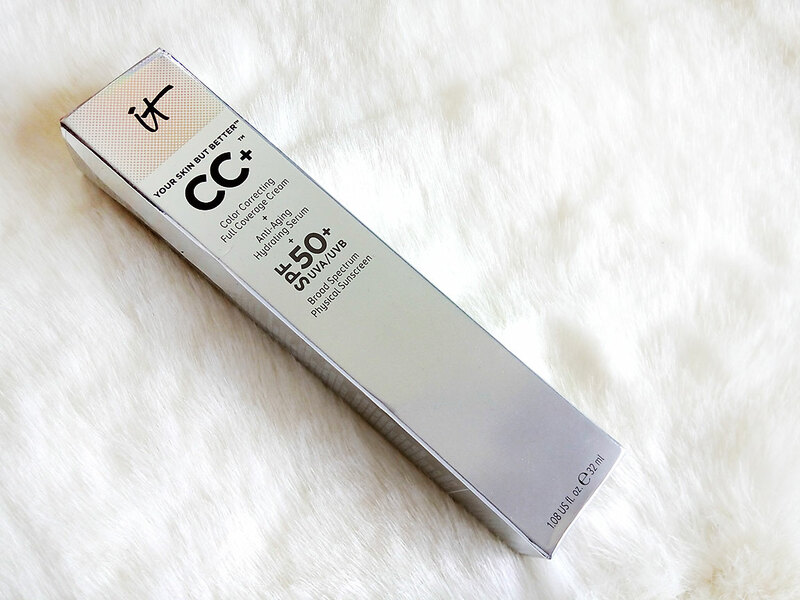 The CC cream is a beloved of most Youtube Gurus and Beauty bloggers around the world. 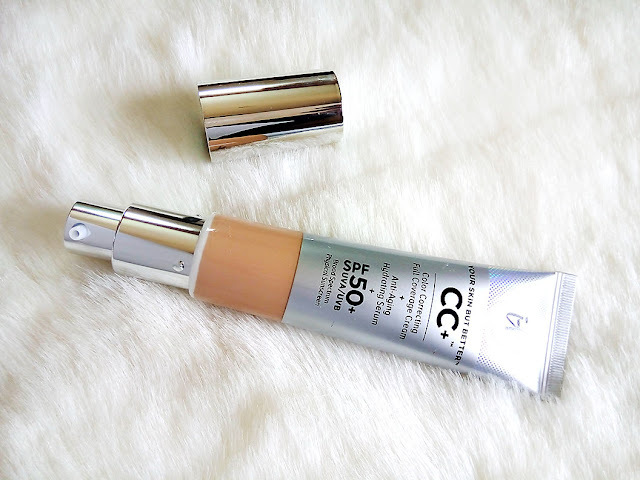 As per brand: "Developed with plastic surgeons, it truly gives you full, flawless, perfect coverage and protects your skin with SPF 50+ UVA/UVB broad-spectrum physical sunscreen. Clinically shown to give you 179% of skin hydration, smooth skin texture and enhance skin brightness, this breakthrough color-correcting cream never creases or cracks and instantly camouflages skin imperfections including dark spots. Plus, it’s infused with an advanced anti-aging serum made of hydrolyzed collagen, peptides, niacin, hyaluronic acid, antioxidants and vitamins A, B, C and E that work in harmony to diffuse the look of wrinkles, minimize pores and give you a more radiant, supple and flawless-looking complexion." Now as per my experience, this CC cream was not full coverage, but gave a good , smooth, medium coverage. It actually has a "your skin but better" finish. After I apply it my skin looks healthier, fresh, more flawless (without full coverage) and smoother. The texture of the formula is light and creamy, doesn't feel heavy on my skin. 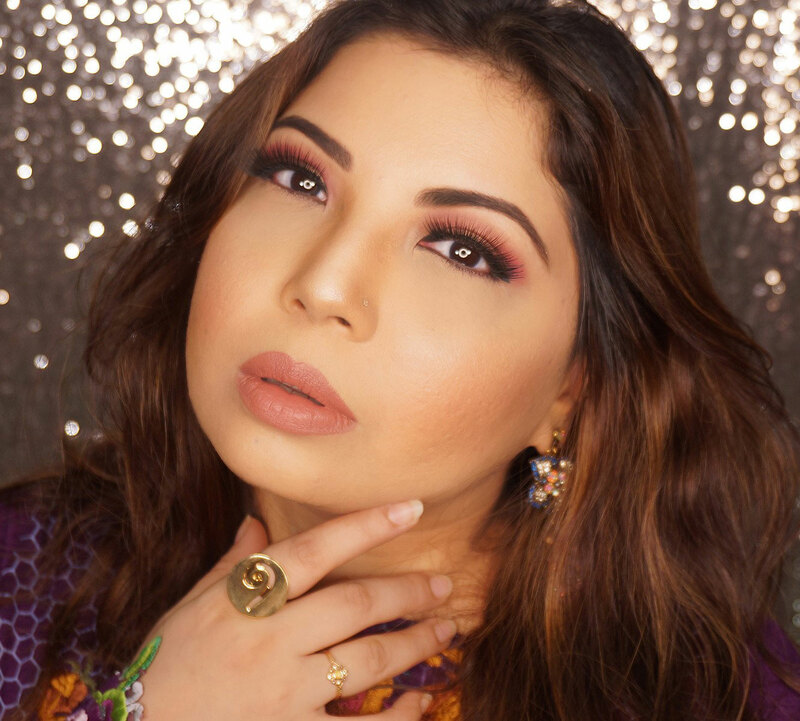 My skin feels very soft after I use it, due to it's hydrating properties therefore can be used as a great base for makeup. 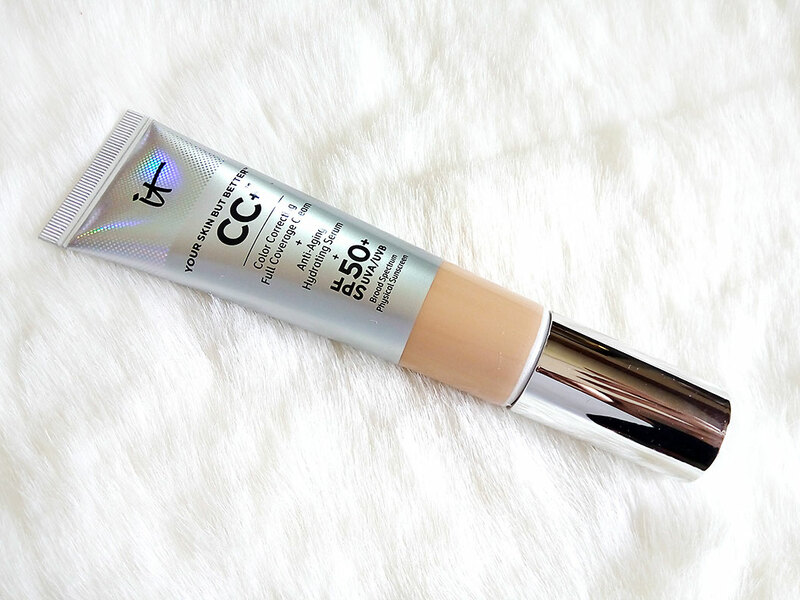 It has a mineral finish and contains a high amount of SPF50 which is great. (NOTE: No matter how strong the spf is if you are out in the sun all day you should reapply SPF every few hours). I have used it for more than a month and it does reduces fine lines though I dont have any obvious ones. It color correct (cc duh!) and makes skin looks a bit more even toned than it is as well as brightens (however it is NOT a fairness cream, so dont get confused). My skin appears to be better than before, for sure. 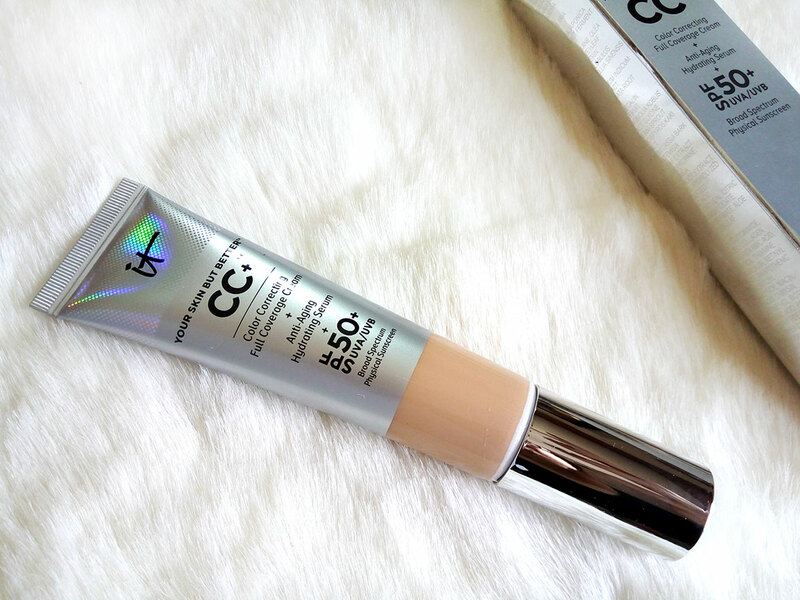 Everytime I wear this CC cream I get compliments on my healthy glow. I have a combination to oily skin and sometimes I get acne. I did hear that this cream has the tendency to cause acne breakouts on very sensitive skin but so far I have not experienced that. Always do a patch test before using any product. This product can tend to get greasy if you use too much so start with a small amount and blend it in for a natural finish. Even though it cost $38 on the IT Cosmetics WEBSITE I ordered from a Makeup page in Pakistan as they don't deliver directly and it cost me $50 which is way too much for this product. 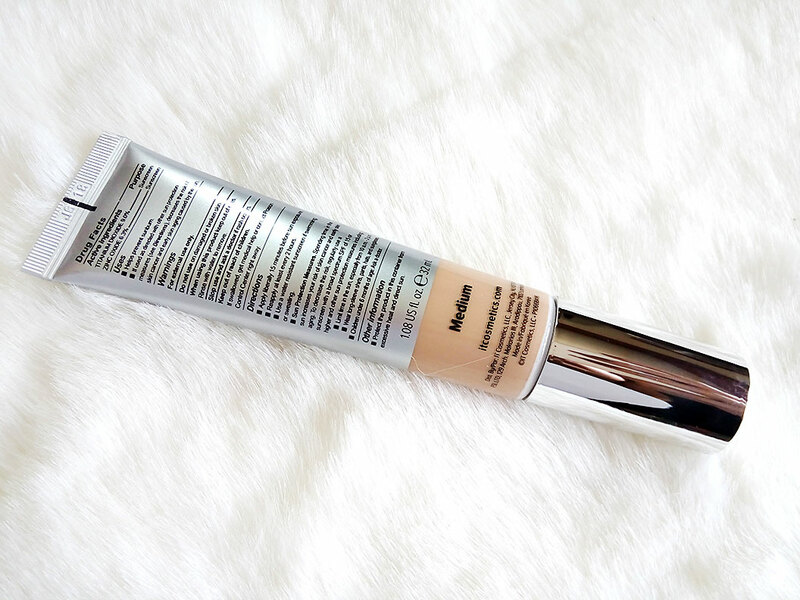 I do like it a lot but I am not 100% sure if I will repurchase it often as it is expensive. However, if I tend to save up extra, I will buy it again.